Saturday morning, husband and I headed towards Terre Haute, Indiana for my third R.A.I.N. 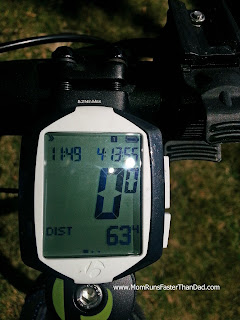 ride, a 160 mile ride in one day. Previous years we had drove down the evening prior and stayed in a hotel. It seemed like a hassle to stay in the hotel for just a short drive, so we opted to drive down before the roosters crowed. Upon arrival, I pick up my registration packet, make my numerous pre-event trips to the fabulous port-o-lets and consume some additional calories all while husband unloads my bike. The temps are a tad nippy, but we all know within less than an hour from the ride start, we will all be glad to wearing as less as possible, within reason of course. This is a family friendly event. I head over to the start line to meet up with cousin one, cousin two and uncle, who are also riding. Less than 10 minutes later and no warning, the ride begins. Only 160 miles more to go, woo hoo! No one's ever claimed I was sane. Oh Look! ONLY 160 miles to go! My goal was to make as few stops as possible, fuel and hydrate better than previous years (a big issue for me as don't eat very well while being extremely active), and for those necessary stops, make them as short as possible, in and out. By mile 38 and my first scheduled rest stop, I had so far succeeded. I grabbed a peanut butter and jelly sandwich, drank as much Gatorade G2 as possible while husband refilled the other bottle and moved on my merry way. I needed to utilize the oh-so fabulous port-o-lets while at the first rest stop, but the lines were long and I didn't want to lose unnecessary time waiting, so I informed my husband I would stop at the next gas station or fast food stop on the same side of the road. He could meet me there. As I headed back onto the road, I could not get my left shoe clipped in for nothing. At first I thought I just wasn't sitting it in there right until after one million attempts, I was convinced that obviously I was having a mechanical failure. I did not want to stop and lose time, so I kept pedaling one shoe clipped and the other annoyingly at his own free will until I could no longer tolerate his insubordinate self. I figured as hilly as this ride is, my detached shoe was only causing more inefficient riding, therefore; losing more time and energy than I would have lost in the moments to call in Personal Support Vehicle a.k.a. husband to make any necessary repairs. Sure enough, when I pulled over to look at the bottom of my shoe, I found the flat metal plate under my cleat had curled up, disabling my clipping ability. Super husband fixed it in a jiffy and I was on my way. By the way, prior to me pulled over to get my shoe fixed, husband had text me to let me know that the public restroom I was looking for in the near future, did not exist. Long story short, my restroom break did not happen until 63 miles, 25 miles since my last stop. Lesson learned. at the 2nd rest stop. 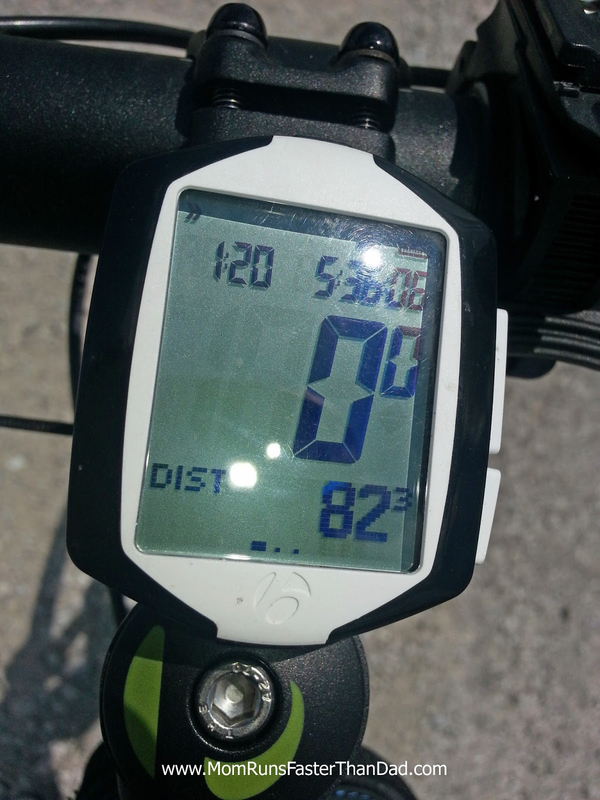 I made sure that rest stop number 2 was just as quick as stop one, other than I was sure to make one other stop. I'm sure you know which one. As before, I grabbed another peanut butter and jelly, drank my Gatorade G2 nonstop while husband refilled my other bottle. I was most likely back on the road within seven-ten minutes, much better than previous year's times. As I log some more miles, I pay more attention to the time and my mileage and realize that regardless of fewer stops and less time spent at the rest stops, I'm about the same time and location I was last year if not farther behind. I had noticed that this year's hills seemed much harder than previous years. I then realize with other rider's comments and my own Ah Ha moment, we've been riding with a ferocious head wind. my husband pick me up. In my moment, while calculating time and distance, I realized it was also about the moment husband intended on taking a quick detour from his wife's support duties and stopping by his family reunion to make his appearance. Husband was made aware of this reunion only two weeks ago and made it appear as if this particular family event was not a big deal, therefore; he would still be available to assist me in my ride. I instantaneously had this overwhelming and uneasy feeling that I couldn't shake. Most likely it was guilt. 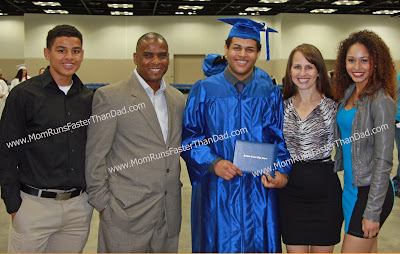 Knowing that it is not only extremely important to my husband to participate in his family's social events, but to have his immediate family with him at that time, I made a quick decision to call my husband and have him get me along the ride route. He should have not been put in the situation to choose between one of my numerous events and his family. When I called husband to be picked up, his first question was of course, what's wrong. As I repeatedly told him nothing, I'm fine, just come and get me and I'll explain when you pick me up. Of course, when he picks me up, I tell him the reason for my decision. He continues to question my motive since in his words, "You quit nothing." and "You don't quit." and "You never quit anything." Yes dear, I get it. I don't quit. As they say, "There is always a first time for everything.". My ride home to grab a quick shower so that I could head over to my husband's family reunion, consisted of an interrogation of what's the real reason you quit? I understand his suspicions considering he knows I literally limped and wobbled in the last 2 1/2 miles of a seven mile race back in the frigid temps of February after my knee blew in excruciating pain out of nowhere, when I could have just as easily called him from the cell phone I was carrying , while he was waiting for me at the finish line, to pick me up. 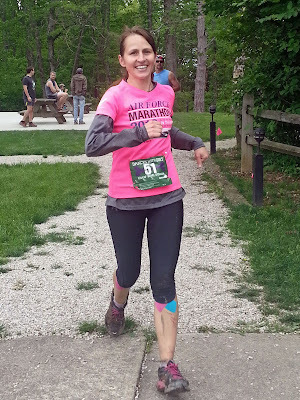 He also knows that after I hit the wall after mile 20 in the Flying Pig marathon in May, I continued the race even though my hands felt as though they had incurred frost bite, it was raining and it took me over 5 and half hours to cross the finish line. So, he's right. I don't quit, except for when it doesn't align with what should be a priority, family. He told me his brother and mom were aware I was riding that day and should not have been completed until later in the evening. What should he tell them? I just laughed. I knew what he was implying; that maybe I would be embarrassed by others knowing that I quit the ride. I told dear husband to tell them whatever HE wanted to tell them. 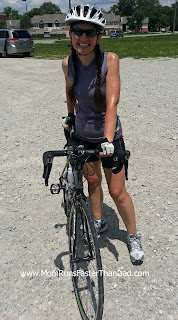 I had just finished over 80 miles in horrendous headwinds, a feat that most people do not complete over their entire lives, let alone the last so many hours. I was not embarrassed or ashamed. I quit because I realized my priorities needed to be adjusted. As they say, "Better late than never." For this same reason, family first, I have chosen to complete the sprint distance triathlon on my 40th birthday this year, versus the Olympic distance. My children are getting older, have jobs, one of them is involved in athletics, two of them are in college, therefore; getting the entire family together all at once for an entire day is an amazing feat in itself. With that being said, I want to take advantage of the day spending as much time as possible with my family before one of them moves out on me this next semester (unless I lock her in her bedroom and deadbolt the door-bwahaahahaaa). Just kidding....maybe! Swimming an extra 1000 meters, running an extra 3 miles and biking an extra 12 miles will never be worth the lost opportunity to hang out with these beautiful people. It will R.A.I.N. next year. It has for the last 27 years. Thanks to those have endured reading my long, sometimes rambling blog entries, liked me on Facebook, and or have followed me on Twitter. If you have yet to do so and are a glutton for punishment, you may also find me here on DailyMile and Pinterest. 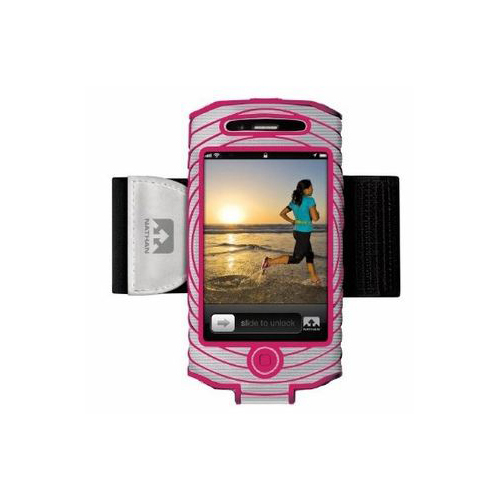 You may also run with me at Ladies Running Indy & Staying Fit. 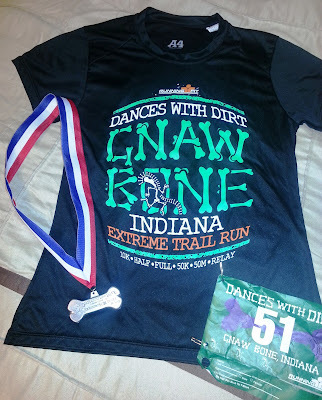 This last Saturday, husband & I headed about an hour south of Indy to a small town called Gnawbone for an extreme 55 mile trail relay called Dances With Dirt. We had a team of 5 called the Trailing Turtles. I did this same race two years ago and it has been one of my favorites ever since. Team consisted of my husband, myself, my two female cousins & one of their boyfriends. Cousins have both participated in this particular race as well. Husband is new to the racing scene and even more so to the trail runs. Cousin's boyfriend on the other hand, has very few miles under his belt if not zero, zilch and/or none, let alone extreme trail racing experience. while waiting for my husband to finish his first leg. The morning started out a tad chilly. Of course, my tendency to overdress got me on my first leg. It was overcast, cold & the chance for rain was there so I headed out into the woods for an 5 and half mile run with a jacket. I ran into the woods and came upon my first hill right away. Just say, I warmed up fast and quickly regretted the jacket. I tied it around my waist right before I hit the 2-3 miles of pure mud. Running and keeping your shoes attached to your feet was nearly next to impossible. After coming out of the nonstop and very thick mud, I came to a very long and steep fast downhill. I enjoyed the quick descent but quickly paid for it by having to make the climb back up as steeply as I went down. 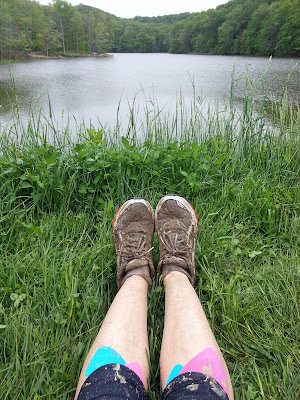 My second leg, an approximate 5 miles and leg seven of the entire 15 legs was lacking the excitement of the previous' mud, and seemed to be a long, non-technical, easy trail for a considerable amount of time. I made this comment out loud to a fellow runner, only to be quickly contradicted just a few minutes later by the overgrown path with heavily laden thorns, branches, & other debris that made running next to impossible. There was no longer an obvious path or any path for that matter to follow. At this point it was up to you to find the flags placed by the race crew behind the brush and thorns to ensure you eventually made it out of the woods. not so muddy this leg. Don't let the shorter distance of my last leg, 3.1 miles deceive you. What it lacked in distance, they made up with extreme uphills & the never ending stairs. Seriously, who decided it would be a good idea to build three million steps out in the middle of the woods? Regardless of who's idea it was, someone else thought it was a fabulous idea to add it to our race route. Oh yeaaa! Note sarcasm. I was sure to have buns of steel when I finished, but no such luck. Just came out of the woods of my 3rd & final leg. This year's "bone" medal was not as impressive as 2011's large skull & bone medal. Oh well. It was a fun race with fun people and my 3rd medal in a week's time span. What more could a girl ask for? I do have one complaint that seriously irked me and the rest of my team and most likely other runners. Part of the event included a BBQ dinner with registration. We headed over to grab a plate at about 6 p.m., one hour before the food & race cut off time was noted. The food was scarce. They were out of buns for the BBQ pulled pork and the rest of the sides were scarce. At 6:15, they were out of food. Runners who had been running all day long came up to the tables to be told they were out of food before the 7:00 cut off. My team agreed that was inexcusable and poor event management. Thanks to those who have endured reading my long, sometimes rambling blog entries, liked me on Facebook and/or have followed me on Twitter . If you have yet to do so and are a glutton for punishment, you may also find me here on Daily Mile and Pinterest. You may also run with me at Ladies Running Indy. Tidbit Number One: I'll be 40 this August! What does this mean? Technically, it only means I was born 40 years ago to that day. For others, it means I'm expected to have this big party with cake & balloons & whatever else is party appropriate. Guess what? This is not on my agenda for this particular day. So, where will I be, you ask? See, I'm not the only one with the same idea! 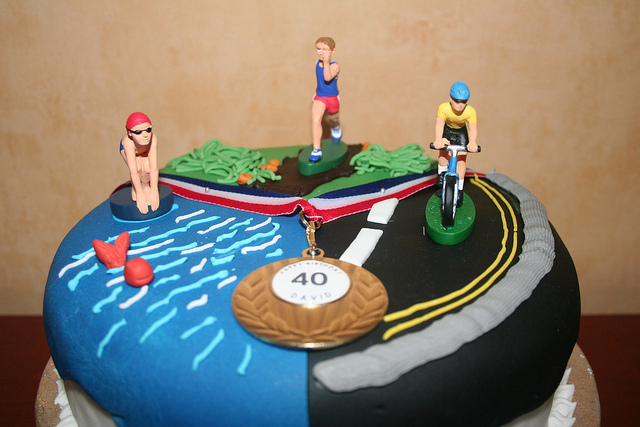 A Triathlon on your 40th! My goal is to immediately commence training for my first Olympic distance triathlon, the Tri Indy once I've ran the 500 Festival Mini-Marathon and the Flying Pig Marathon on May 4th and 5th, respectively. I figured it to be fate when I found this tri to be on my actual 40th birthday date. What more could a girl ask for? Well, according to almost everyone else....friends, family; I should be asking for a big party. If you want to be a part of my 40th birthday, let me know and I'll point you in the direction of my tri finish line. I will at least make sure there is cake. Coincidentally, I'm currently watching the movie This Is 40. Tidbit Number Two: I'm currently on vacation in Florida. I'm happy for the sunny skies and warmer weather. Indy weather has been less than desirable for alleged March and the Spring season. I'm just too happy to head out, finally, in shorts & a tank; no accessories needed. I can do without gloves, a hat, and having to question my judgment on whether a second layer is needed. Husband and I headed out for 6 mile run the first full day we were here and then took in a short 8 mile bike ride. It was fabulous. 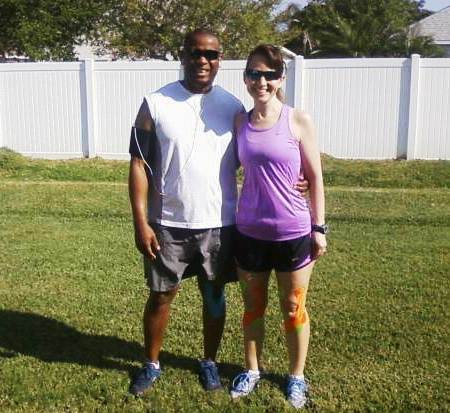 Brother-in-law that currently has the privilege of our presence, lol, was so amused by our KT Tape that he insisted on taking a picture. Third and Last Tidbit: I almost didn't take this vacation. Why, you ask? Long story short, we've taken a Spring Break vacation with all 3 of the kiddos for the last so many years that I've lost count. Last year, we took our standard beach side vacation....with only 2 of those 3 kiddos. The other & oldest and at the time, a high school senior felt that her last year of high school was more worthy of a different endeavor than hanging out with dear old dad and mom. I agreed to let her hang out with her best friend and my mom, both who live in Vegas for the week. I was ok with that, since she was with her grandmother and what I consider family friends. Fast forward a year. We scheduled our usual spring break vacation but knowing that once again one of us would be missing. My previous high school senior is now a college freshman and her spring break schedule doesn't coincide with the other two. I know that's part of life and I was alright with that, kind of. Slowly, they dropped like flies. 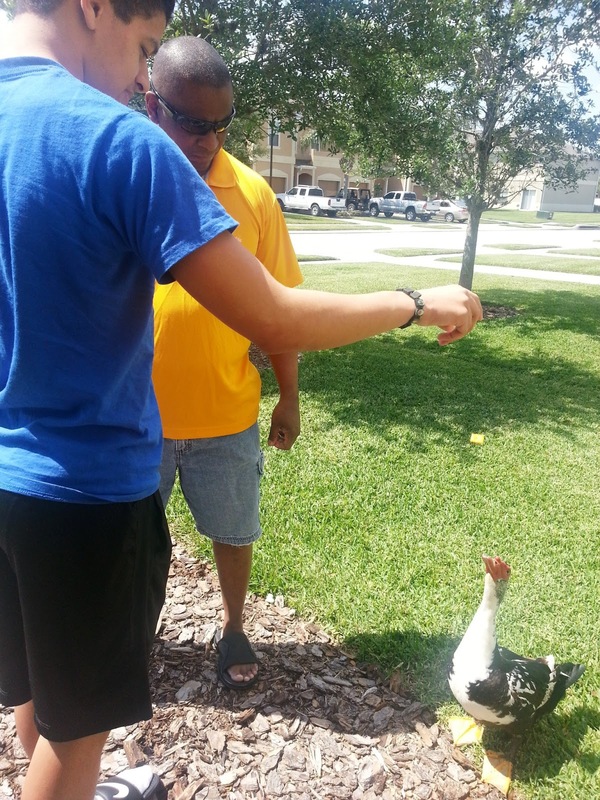 The youngest wanted to spend the week with friends in Florida. The middle one eventually said he didn't want to go at all. As he's gotten older & has outgrown making sand castles and burying his brother in the sand, he veers away from the sun, sand and surf like I veer from 40th birthday parties. I understand his pain. Just because the rest of the common population enjoys something, doesn't mean you should be required to join. "To each their own." as I frequently say. Regardless of my respect for his dislike of the sun and sand I crave, I wasn't ready for the full family separation. I called my husband at work and asked if he would be too horribly disappointed if we didn't go at all. At this point, it's just husband and myself on vacation, a Spring Break vacation that is generally spent with the kids. It bothered me so much to the point I felt sick. Husband obliged my mental breakdown and agreed that we wouldn't go. With a tad convincing from the older kids and against my better judgement, I eventually agreed to go. Everyone still has all of their limbs, the house is still standing according to the neighbors, and the police have yet to be called to my house. 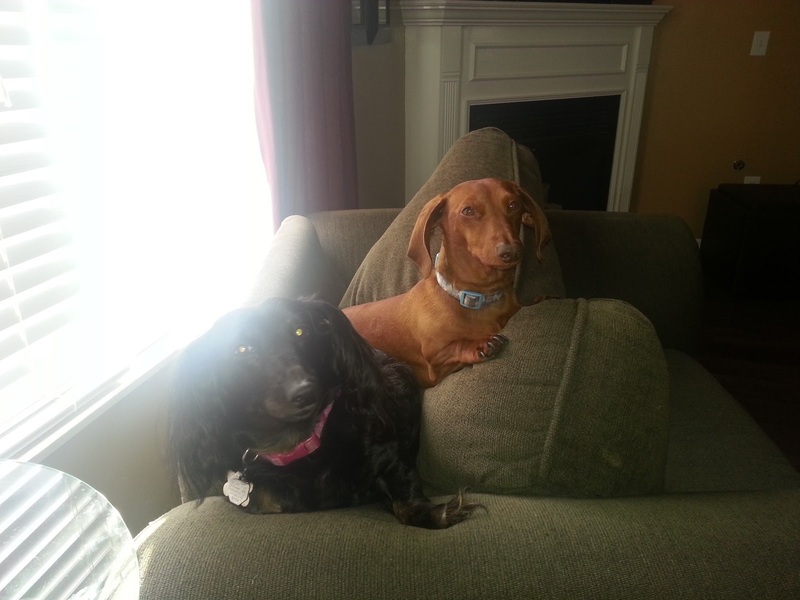 The only incident I've been informed of is the attempted get away of the dachshund duo. They were caught and brought home by a helpful neighbor. I'm only wondering what they were trying to get away from. They never attempt to leave when I'm at home. Can you only imagine the blog post when one of them tries to move out? Fourth Tidbit: I know, I know, I said the last tidbit was my last. It's my blog and I'll add tidbits if I want to. 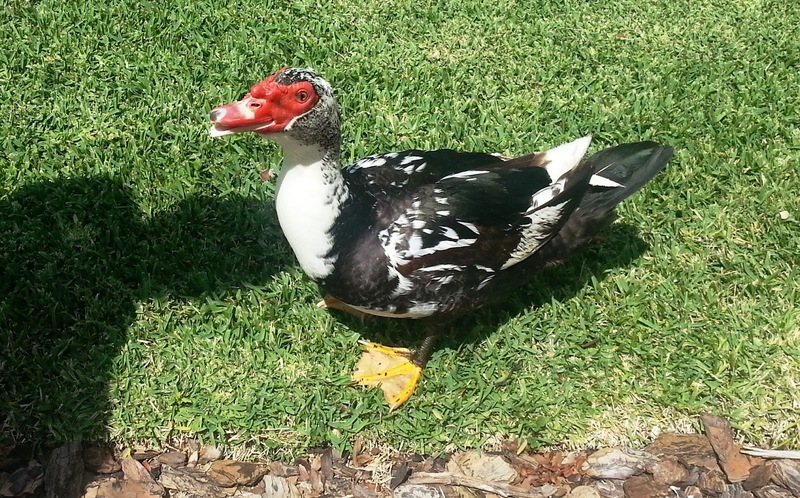 As we were leaving my brother-in-law's condo the other day here in Florida, I seen a type of duck that I had never seen before, even in my many years of trips here. He seemed quite friendly and approachable. Coincidentally, I had a box of Cheez-its in the car. I grabbed a handful and he quickly snapped them up. The next day, guess who was at the back door? My duck! I fed him again and named him Dexter, just like half of my dachshund duo at home, because his eating similarities to him. He snaps his snacks right out of mid-air. He has been back to see me today as well. Brother-in-law insists Dexter will be disappointed once I leave, as he will not continue his daily snack ritual. I've already informed him I will inform all of the neighborhood kids to knock on his door daily if he doesn't feed ducky. I'm done now. There will be no fifth tidbit that is really my last. Thanks to those who have endured reading my long, sometimes rambling blog entries, liked me on Facebook and/or have followed me on Twitter . If you have yet to do so and are a glutton for punishment, you may also find me here on Daily Mile and Pinterest. You may also run with me at Running Indy. I'm sure you've heard it a thousand times from your mom, your dad or anyone else doing something that they know they have no business doing. Whether it be something as silly as drinking from the milk carton (oooh, YUCK) or as something even more serious as texting while driving (now that's just flat out stupid). "I just came from the doctor with an antibiotic prescription for bronchitis & laryngitis. Should I run a half marathon tomorrow morning? I've been coughing my lungs out non-stop for a week, have absolutely no voice, & have been exhausted. Oh yes & don't forget, I haven't ran a mile since last Saturday, one week from tomorrow's race". I would have answered so sympathetically with a "Seriously, brainiac! Are you out of your mind? Take your rear end back to bed & stay there & forget about tomorrow's race." It takes a lot for me to see the doctor, being sick is usually not one of them. Me just being there indicated I was feeling near death. In fact, my knee injuries dwell for a week of wobbling & pain before I drag myself there. He stated he was surprised to see me for any other reason than a grapefruit size, swollen knee, herniated disc, etc. When I was leaving the Dr.'s office with my prescription, he asked me if I had a race that weekend. I've been seeing this particular Dr. for years and with my lack of fabulous knees, he's quite familiar with my running endeavors. After a diagnosis & a prescription, he slowly asked me if I would be cancelling my racing intentions. Ok, it was more like a "You will be cancelling this race, won't you?" I gave no definite answer knowing good and well I had no intentions of cancelling any race. Besides the excessive coughing, I woke up the morning of the race not feeling too bad. As usual, I went back & forth with what to wear. I have yet to accomplish dressing just right in the cold so that I'm not too cold or too hot. Maybe I can get a lesson from Goldilocks. I headed for the race a tad early to try to meet up with a couple of fellow running group members. Once I got there, the race registration area was a lot more crowded and there were more runners than I remembered from last year. I did my usual "go to the bathroom as many times as possible" prior to the race before I headed outside for the race. Thankfully, this was one of those cushy races that the runners have access to the warm interior of a building with clean public restrooms. The outside cold port-o-lets were only used as a last resort. What more could you ask for? It started out a tad brisk. I appreciated the jacket that I decided to grab out of my car at the last second.....at least for now. It eventually ended up around my waist once I warmed up. It doesn't make for great race pictures as you can see here, but it served its purpose. 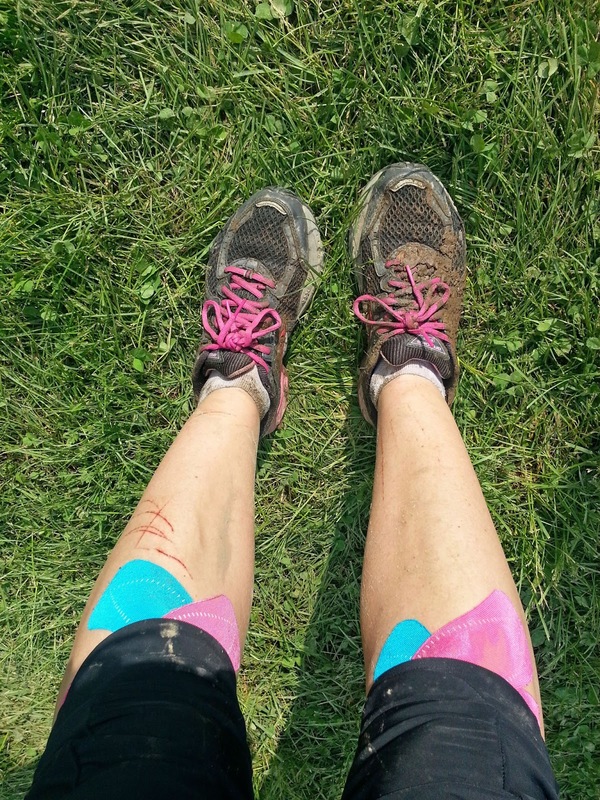 As I progressed into the mileage of the race, I was pleasantly surprised at how well I felt for just being as sick as I had been the week and even day prior. There was little coughing and my lungs felt good. I don't remember at what mile, but a fellow runner lady, Nina & I sparked up a conversation and kept it going for a considerable amount of the race. I usually run out of the ability to hold any conversation past the very early stages of a half, as I tend to attempt to preserve all energy possible. 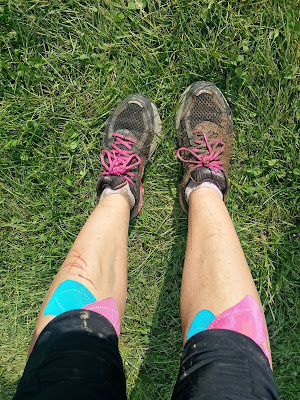 Even though the coughing seem to have subsided, as least for now, my legs began to express their distaste for my attempt at 13.1 at who knows what mile. 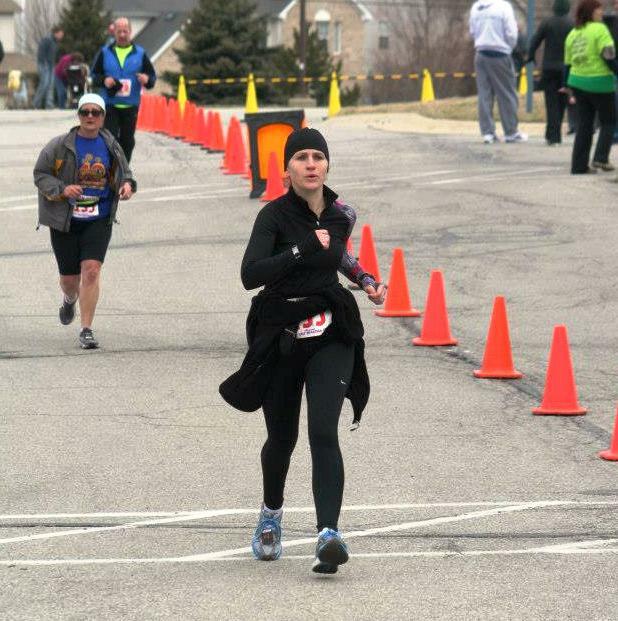 I began to feel every single muscle in my legs that had not been used since the weekend prior when I had ran the Shamrock Shuffle 15k. It took everything I had to push through. I think it was about mile 12 where I had to walk. I spent about 45 seconds walking when Nina, who I had lost for a few miles came up behind up and lended some moral support. It was the boost I needed and I picked my pace back up. I finished the race in 2:15:48, not a PR but not my slowest. I was ecstatic considering my previous week's condition. I headed back inside to the race headquarters to find a runner friend to see how she had done. She had a PR and her first half under 2 hours at 1:59:31. Congrats to her. I headed home to meet up with husband so that we could get in his training run of 8 miles & I could finish up the remaining of my 18 miles. Long story short, the remaining 5 did not go as well as my first 13.1. I started out with my husband at his pace. It was immediately painful. I thought maybe I could do a walk-run. Just say that didn't work out so well. I guess the lack of running the week prior had caught up with me. I ended up walking the 5 slowest miles of my life. Husband finished his 8 mile run before I finished my 5....Yes, that bad. Regardless, I got it done. Coincidentally, I went to a Dr. appointment with my daughter the other day, the same Dr. I had just seen last week, the day before my race. Before addressing my daughter's issue, he had to ask me if I raced the last weekend. I told him that I did. His response, "Of course you did." 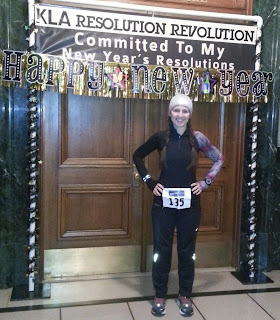 Note to self & word of advice: Do not register for a run the morning after a New Year's Eve Party you are hosting. When a party doesn't end until 1 a.m. and you stay up in attempt to clean up the mess until 2 a.m., getting up in the wee wee hours of the morning to run in the ice cold doesn't seem so fun when your alarm goes off. If it weren't for the fact that I am as cheap as you can get and unless I'm close to death, I refuse not to run if I've paid for registration. Since I had preregistered and a running buddy was expecting my presence, I headed out into the frigid temps of downtown Indy. The Ken Long & Assoc. 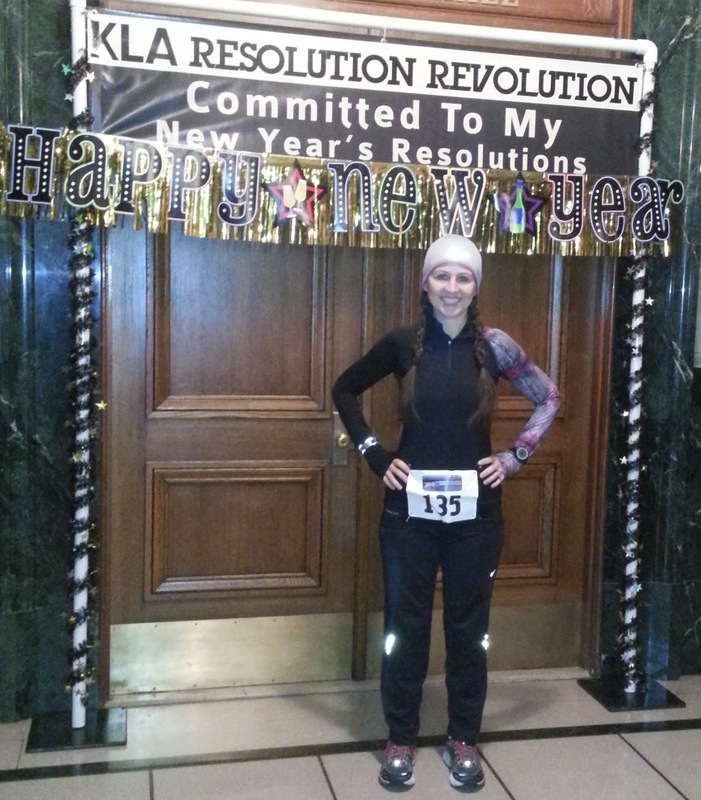 's Resolution Revolution was the local run to celebrate the new year. 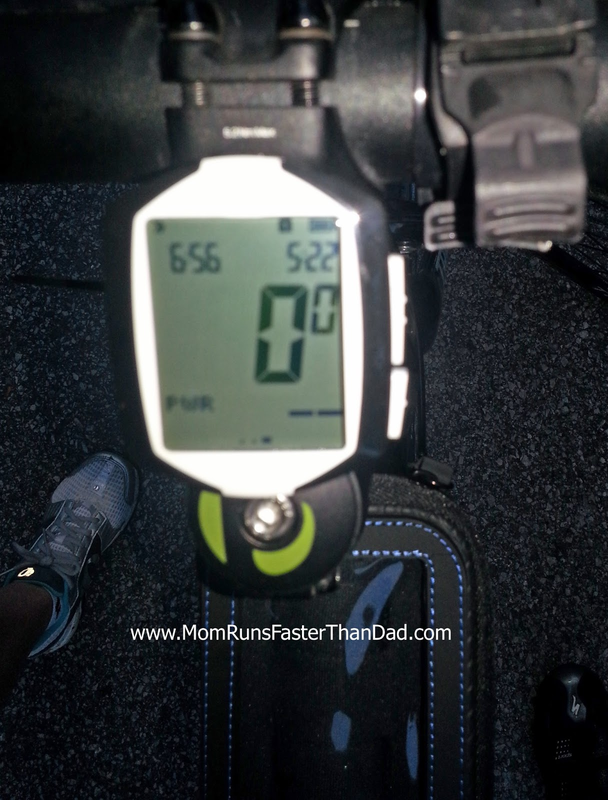 It was a non-timed run that you could do in 3 mile increments of 3, 6, or 9 miles. Prior to staying up until 2 a.m. and heading out into temps suitable for icebergs & penguins, I had every intention of doing the full 9 miles. I was glad that I had gotten my tired, cold rear out of bed. As they say, "The only workout you ever regret is the one that you didn't do. ", or something like that. I met my friend in the nice warm building of the Indiana War Memorial where we waited to see if we were the lucky winners of any door prizes. Much to my surprise, they called my ticket number for a Nathan's Sonic Boom iPhone 4s armband. I don't have an iPhone, but my daughter does, and she was quite delighted with the unexpected gift. We then ventured out into the icy cold air to toast our way into the the new year with champagne in cute little plastic toasting glasses. I was so cold and shivering so bad, that I had to hold my cup with one hand and steady it with the other to avoid my champagne shaking out of the glass. I'm not fond of the majority of alcoholic beverages including champagne, so I toasted my running partner, took a miniscule sip and let the rest find its way into the snow. We commenced our run with no final decision on whether we were going to finish after 3, 6 or 9 miles. We decided out loud that we would make that decision closer to the end of the first 3 mile loop based on how we felt. In my head, I told myself I would run whatever "running partner" decided was best for her all while secretly hoping she was in no more of a mood to run than I was. So around mile 2 and half or wherever I was at this particular moment, with fingers that hurt they were so cold and a face I could no longer feel, "running friend" stated her intent to finish up this frosty run at the first loop. For someone who hates to pay for 5k's because of the "lack of mileage" I'm paying for, I was uncharacteristically ecstatic. HA, Please take note, on January 1st, 2013, I Christina a.k.a as "MomRunsFasterThanDad", became a running "wienie". Listen to me whine........It was too cold, I was too tired.......blah, blah and more blah. No, I don't want any cheese with that "whine". So, 9 miles diminished to 3 and I took my happy, frozen body parts home where I finished cleaning the remnants of the night prior and then became one with the recliner for the remainder of the day. Thanks to those who have endured reading my long, sometimes rambling blog entries, liked me on Facebook and/or have followed me on Twitter . If you have yet to do so and are a glutton for punishment, you may also find me here on Daily Mile and Pinterest. January Challenge: 30 Days of Planking! This is my first fitness challenge ever created. I will not lie! This isn't just for your ladies and gentlemen. You motivate me as much as I hope that I motivate you. This is to keep us all accountable and motivated through the first month of the new year, 2013. The challenge is simple. One minute of plank for each number of the date (ie. 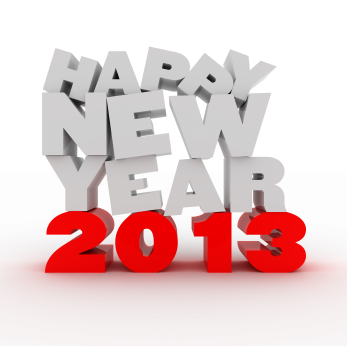 Jan 2= Two 1 minute planks, Jan 3= Three 1 minute planks, Jan 31= You guessed it...Thirty-One 1 minute planks! At least you have all day to get them done as you see fit. 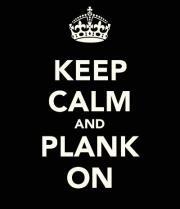 Feel free to vary your planks! Make them as difficult or as easy as you need. Do a side plank today and shake it up tomorrow with a leg raising plank. Join us over at Facebook to chart your progress and to hang out with some fabulous, fit minded people.